We were an extended family with five cabins and ranging in ages from 23 months to retirement age. The Summit was well maintained and the décor was beautiful - understated elegance without snobbery. We were not bombarded with upselling which was very appreciated. The captain was very visible and accessible. We had a lot of OBC and therefore booked our excursions through Celebrity. They were for the most part well done and very enjoyable. We found the food to be great. Even though we were in a top suite, we ate in the Main Dining Room four of the seven evenings to eat with our other family members. Luminae was very well run and very enjoyable. We also ate in Tuscan Grill and would rate it excellent also. We had the Penthouse 6147 with the adjoining Sky Suite 6145. The butler, Ram, was excellent - unobtrusive while still very accommodating, Between Ram and the room steward, Martha, we had a wonderful week. Also, adding to this was Michael&apos;s Concierge Maja, who helped to meet all our needs and expectations. When we found problems with the suites they were addressed immediately and taken care of completely. 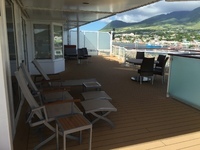 In comparison, we also had two Family Verandas and one Veranda. 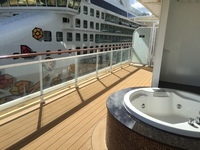 These cabins were in good condition and serviced professionally and all our family were happy with the ship, public spaces, restaurants, cabins, itinerary, and entertainment. The Penthouse (and adjoining Sky Suite 6145) was in great condition and beautifully decorated. It is very spacious and well laid out. The large balcony had new furniture and the soft surfaces in the living/dining room seemed new and were very comfortable. This is a great way to cruise. The river tubing part was cancelled (50% refund) due to heavy rain and fast rapids. This was a three part excursion. This was a three part excursion and this part was cancelled. This was a very well run excursion. This was a relaxing snorkel experience which was appreciated after a long day of travel the day before. Beautiful boat, very enjoyable sailing, and a great lunch. I loved this and would love to do it again. My spouse felt claustrophobic and although he enjoyed it, would not do it again.